Hong Kong’s scheme for quality migrants is a highly selective, quota–based migrant entry scheme which allows selected applicants who are selected in any of the two tests — General Points Test and Achievement-based Points Test to migrate to that province. It selects only those applicants who are highly skilled and talented and have the potential, capability, etc. to enhance Hong Kong’s growth and aid its economy. The actual process for the quality migrant scheme seeks to ensure that the applicant fulfills a set of prerequisites and also passes either of two points-based – General Points Test and the Achievement-based Points Test. And further to that, he/she competes with the other applicants in either of the points-based tests and obtains a high enough score beating the other competitors in any particular round. Those who succeed in this scheme (Hong Kong Immigration) can also sponsor or bring their spouse and unmarried dependent children under the age of 18 to Hong Kong. This is so (or, is possible) provided that they have he/she has the means of providing support and accommodation to their dependents based on their independent financial resources and by not becoming a burden on public assistance in Hong Kong. It is also true that this scheme (Hong Kong Immigration) is not applicable to nationals of a few countries such as Afghanistan, Cambodia, Cuba, Laos, Korea, etc. But, even before an applicant for Immigration to Hong Kong chooses to apply for the points test, he/she has to clear some pre-requisites. And, these pre-requisites are as follows: age-wise prerequisite (the applicant must be over 18 years of age), financial requirement (the applicant should be able to show that he/she is capable of supporting himself/herself and his/her dependants, if any, on his/her financial resources), good character pre-requisite (the applicant ought not to have a criminal record or any adverse record in Hong King or anywhere else), language pre-requisite (should have good knowledge of both written Chinese and spoken Chinese (Putonghua or Cantonese) or English), educational background pre-requisite (i.e. must possess a good educational degree or a first basic degree from a recognized university or an equivalent degree). 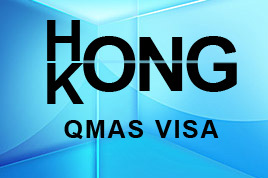 After the above pre-requisites have been met, the applicant for the Hong Kong Quality Migrant Admission Scheme must either ‘pass and compete’ in a points-based test or have an exceptional achievement to his/her credit to be considered for the Hong Kong Quality Migrant Admission Scheme. The points-based test assigns points for ‘age’ (the lower the age, the more points he/she is awarded; maximum of 30 points), academic/professional qualifications (a maximum of 45 points), work experience (a maximum of 50 points), language proficiency (a maximum of 20 points) and family background (a maximum of 20 points) An applicant ought not to not only get a minimum number of pass marks (80 points) but also compete with other applicants who have applied, on the points scale. As for the achievement-based test is concerned, it pertains to those individuals who have exceptional talent or skill and who have outstanding achievements to their credit. Typical examples include those who are awarded a ‘Nobel prize’ or an ‘Olympics medal,’ etc. Those who think they meet the prerequisites and the selection criteria can apply for Hong Kong Immigration by filling up a relevant application form (ID(E)182), etc. but also a decision of the director of HKSAR with the help of the committee, who makes a decision based on the submitted application, attached documentation, other material and relevant facts, information, etc. How to immigrate to Hong Kong from India?